Savour life at Peller Estates where winemaker Katie Dickieson and winery chef and TV personality Jason Parsons work together to create Canada’s most creative wine and food experiences. Sample an extraordinary range of wines from the delightful Sparkling Rosé to the powerhouse Signature Series or enjoy innovative wine-tasting experiences including the 10Below Peller Icewine Lounge. Peller Estates is based on three generations of commitment to excellence in both cool climate grape growing and winemaking. Winemaker Katie Dickieson has been leading our team since 2012, but her career with our winery began during her first vintage in 2006. 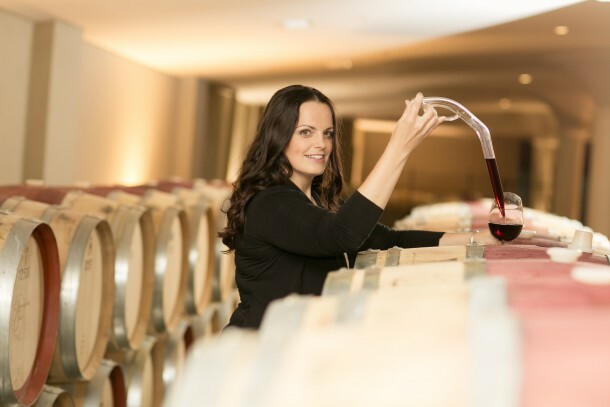 Between that first vintage and her return to Peller Estates, Katie spent time honing her winemaking skills in several cool climate regions including British Columbia, New Zealand and France before settling back in Niagara. Peller Estates is literally on the edge of cool climate for viticulture! With the winter temperatures our region reaches, we are only able to grow grapes in Niagara due in part to the Niagara Escarpment and effects of Lake Ontario. The micro-climate in our Niagara-on-the-Lake vineyards are blessed with the moderating effect of Lake Ontario which provides warming in winter and cooling in summer. Lake breezes in the summer do not allow heat to accumulate in the vineyards, which slows and evens berry development over the growing season, preserving acidity and aromatics. Our average GGD would illustrate our region as being cool climate and our relatively short growing season and proximity to cold landmass bring on an earlier fall and winter than in warmer regions. Our winemaking style incorporates a judicious use of oak to respect our fresh fruit aromatics and a measured approach to malolactic fermentation and lees management. We aim to produce cool wines with balance and ageability! Our Signature Series Chardonnay vineyard bears 25 year old vines grown less than 1km from Lake Ontario (Niagara Lakeshore). The lighter, sandy soils help control vine vigor and produce fruit of exceptional quality. Further into Niagara-on-the-Lake, our Chardonnay blocks in the sun-soaked Four Mile Creek sub-appellation have an early bud break, maximizing our growing season and offering fruit of great maturity, fruit intensity and richness.